The one stop Shop! Do you need to sell? We buy! Some people price their inherited property at an amount they think the market might pay for the house. However, there are many factors that go into this price and one of the biggest considerations is: how fast do you want to sell? Selling through an agent “on the market” can take months, and you’ll have to pay for the house and maintain the property the entire time. That can be costly and can eat into the higher price. Many property owners quickly learn that they’re almost better off to price slightly lower for a faster sale… they might get less for the house but they also pay less on repairs, carrying costs, effort, and time, so it’s ultimately a trade-off that might turn out to be a total wash.
A better approach would be to work with a real estate company and find out what they can offer you, and recognize that the price might be lower than you were expecting… not because the house isn’t worth as much but because your wonderful memories have accidentally inflated the price! If you inherited the property from a loved one who had lived in the property for many years then you might find out that the property needs some repairs. You could choose to do this work yourself and then ask for a higher price but why do that when you could save yourself the time and effort (and what you’d have to pay for equipment, supplies, or a contractor) and instead just ask for less and give a “repair discount”. That way you avoid the hassle of the work, and you still come out the same financially. An inherited house can be a lot of work so if you’re thinking of selling it, you’re certainly not alone. But how do you price an inherited house? 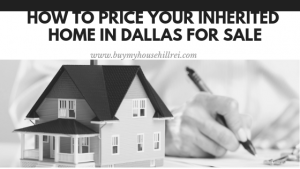 These tips will guide you on how to price your inherited home in Dallas for sale. Why not bypass all the work and cost of selling through an agent and instead get in touch with us today about selling your inherited property to us here at Hill Real Estate Investments? Just call us at 817-442-2669 or click here and enter your information in the form. Hill REI is a one stop shop for your real estate/estate sale needs. Visit www.hillreiestatesales.com or Call 817-442-2669! Hill REI and Hill REI Estates did an amazing job for us. They were very professional and got everything completed in a timely manner. They did the estate sale for us and then we closed on the house with Spencer and the Hill REI team. I Can’t Sell My House In Dallas TX… Help! Hill REI is an investment firm that specializes in helping homeowners get rid of properties fast. We are investors and problem solvers who can buy your house fast with a fair all cash offer.